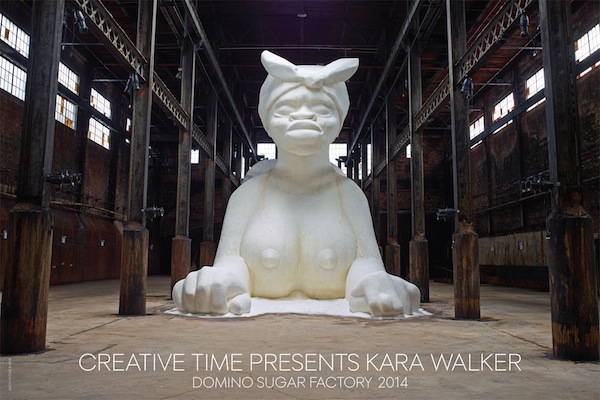 Last summer, artist Kara Walker created an installation of epic proportions in her Brooklyn exhibition, “A Subtlety.” Presented by Creative Time, “A Subtlety” was created to honor people that have been historically exploited and marginalized; it was set, appropriately, in the Domino Sugar Factory in Williamsburg. Recently, Walker responded to the reactions “A Subtlety” received from visitors, as well as to the art world’s ongoing conversation about white visitors viewing the works of artists of color. Jezebel’s Clover Hope reminds us, “Remember all those obnoxious people who took selfies with Kara Walker’s ‘A Subtlety’ installation this past summer? The artist finally addressed the foolery in her first interview since the exhibit wrapped in July,” of Walker’s interview with Carolina A. Miranda for the L.A. Times. 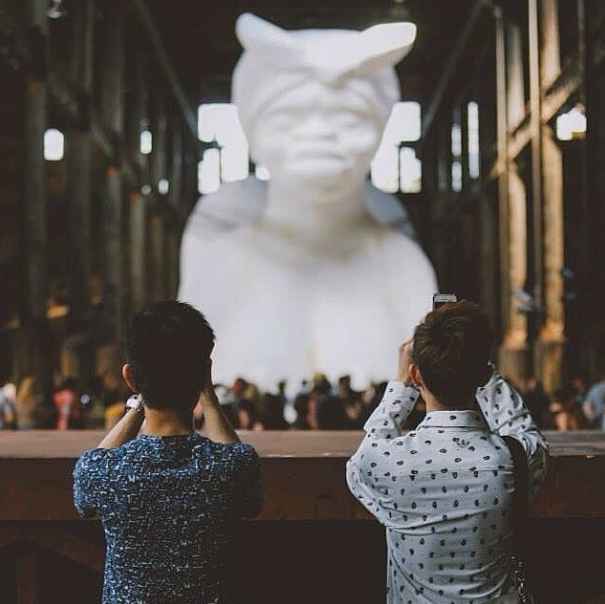 “The photos, which were searchable on Instagram or Twitter via the hashtag #karawalkerdomino, were a classic example of the problem with white gaze in the realm of black art and how easily ignorant jokes can undermine historical significance,” explains Hope. Although the intention behind the work was lost on some viewers, Walker seems to find value in all of the reactions to the installation. She says, “That is part of an ongoing debate about black creativity, through the 20th and now the 21st century. It’s ‘Who is looking?’ And it’s always been the same answer for the most part,” she says, of the disproportionately white viewers that attend gallery openings, installations, and performances by artists of color. As Hope points out, Kara Walker “expected both the sophomoric and the intellectual reactions” to “A Subtlety.” She is currently processing them and turning them into a new work, which will inevitably expand the dialogue about the intersection of race and art. Read the entire L.A. Times feature by visiting the Kara Walker Q & A.